WordPress is popular. Many users love the possibilities the system offers and see no problems. At WpUpgraders we focus on professional maintenance. We see WordPress problems on a daily basis. Time for an overview of the problems we come across and the solutions that are available. Before you tackle these kinds of problems we advise you to make sure the back ups of your website are in order. Notification: Briefly unavailable for scheduled maintenance. Please check back in a minute. 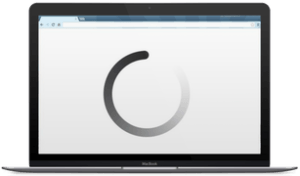 A common problem is a slow website. We’ve written various blogs about this issue. The most important cause is slow hosting. Start with a good Managed WordPress hosting. Is your hosting fast? You can work to improve the speed of your website yourself. With unexplainable visual changes your WordPress website looks different even though you haven’t updated it. The website isn’t offline. The cause could be anything. In this case it’s important to start by emptying the cache. Start by refreshing the browser cache via Ctrl + R (Windows) of Command + R (Mac). The page will then be reloaded without using the cache from the browser. A more thorough way is to remove the entire cache from your browser. Do you use a caching plugin like WP Super Cache, W3 Total Cache or WP Rocket? In that case you can log into the WordPress back end and empty the cache there via the plugin settings. Lastly, sometimes caching happens at server level. In most cases you can log in to your hosting provider’s admin pannel and empty the cache there. 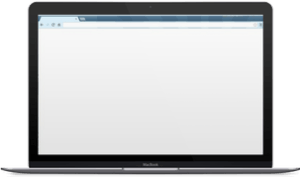 After working on your website you encounter a white screen. The cause is usually a PHP conflict in a WordPress plugin or your theme. It may also have to do with the maximum memory available for your WordPress website. In these cases you should get an error notification from the server, this is just hidden from outside users. When you see a white screen the problem is probably your website and not the hosting provider. Still, it can’t hurt to make sure the server is accessible. Ping your WordPress website and you will find out if the problem is at a server level. There are also other interesting tests you can run from the Ping website. The white screen indicates there are error notifications, but they are not being shown. 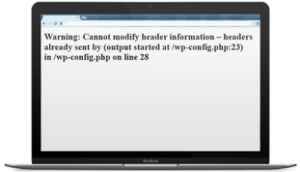 Sometimes you can see an error notification by turning on the WordPress debug function in the wp-config.php file of your WordPress website. 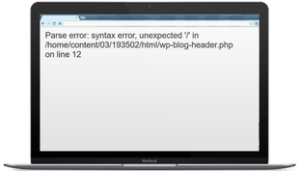 PHP errors will then be shown in your WordPress website. You can change the wp-config.php file with a FTP program. The file is in the main folder of your WordPress website and can be edited. Make sure the debug function is on: WP_DEBUG is normally set to ‘false’, set it to ‘true’ to show notifications. Have you just updated WordPress? Or did you accidentally make a wrong change to WordPress files? In that case WordPress could be the cause. Go to your website files via FTP and overwrite all WordPress files with the latest version. Find the latest version of WordPress here. What is the last plugin that you changed or installed? That is probably the problem. Try to deactivate the plugin via the WordPress back end. Doesn’t work? Deactivate all the plugins. If the website is working again your can re-activate the plugins one by one. Can’t access the WordPress back-end? Use FTP to deactivate the plugin(s). You can do this by renaming the plugin directory in the directory /wp-content/plugins. Put a number in front of the name, for example. The name change will mean the plugin will be seen as a new plugin and will not be activated. 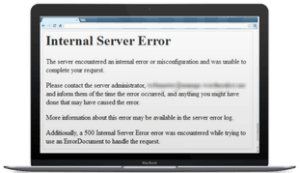 Another possible cause for a white screen is that there is not enough memory available on the server for your WordPress website. For example, because there are a lot of visitors to the site or because of a plugin or script that takes up (too much) memory. This problem often occurs with cheap, shared hosting in combination with WordPress websites with heavier plugins like WooCommerce, WPML or other plugins. Increase your memory yourself. See http://codex.wordpress.org/Editing_wp-config.php#Increasing_memory_allocated_to_PHP. Deactivate plugins that you think may take up a lot of memory. Use the tips above: ‘Switch off conflicting plugin(s)’. A last option is to contact your hosting provider to talk about increasing the memory for your website. Tip: you can find out how much memory is available via the WordPress phpinfo() plugin. Is your homepage working, but all the other pages are white? In that case the permalinks might not be working properly. You can solve this problem with a quick fix by going to Settings -> Permalinks in WordPress and changing the settings to standard. The actual cause and solution, however, are at the hosting level. To be able to re-write the standard permalinks to ‘good permalinks’ the mod_rewrites module (for Apache) or a similar module (for Windows servers) needs to be on. As soon as the settings are right on hosting level you can choose the permalink structure you want via the WordPress back-end. WordPress itself and the plugins not the problem? Check to see if the theme is the source of the problem. In general, themes aren’t usually the source of the problem. It is possible however. If this is the case, deactivate the theme via the back-end or via FTP, just like with the plugins. Take into consideration that switching off or changing your theme will have consequences for your widgets, theme settings and menus. Overwrite your theme with the newest version available. Finally, it’s possible that the white screen is due to the fact that there is no theme activated at all. The theme could have been removed via FTP. In that case you get your website back by activating you (child) theme. When you see these notifications you have usually (but not always) done something wrong. This notification is usually given when there are PHP problems with plugins or thema’s. Exceeding the memory or a modified .htaccess file could also be the problem. Rule out problems with caching. Follow the instructions for Unexplainable visual changes. See the instructions for White Screen of Death – WSOD. You just – consciously or unconsciously – made a change to the .htaccess file. If you access the website via FTP you can see the .htaccess file in the root. Rename the file. For example, by calling the file .htaccess_old. If the website works again after changing the name you know that the .htaccess file is the problem. After renaming the file it’s important to make a new .htaccess. You do this by clicking Save changes in Settings, Permalinks. 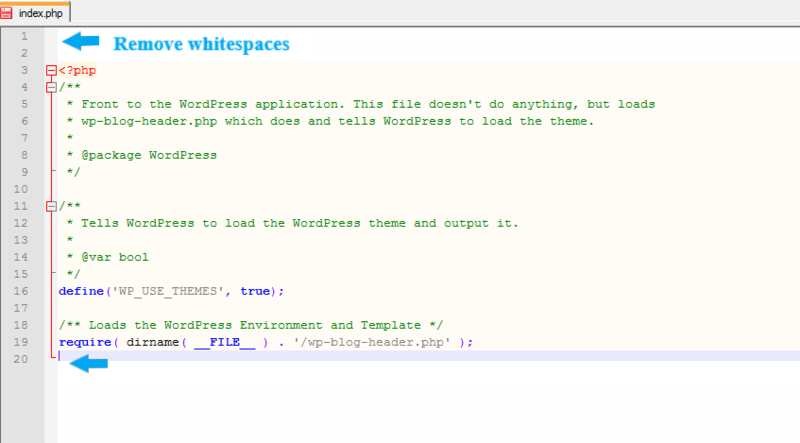 If there is no .htaccess file WordPress will create a new one. Specific files or authorizations do not have the right permissions, which causes an Internal Server Error. The easiest wat to fix this is to repair the folder permissions and set up the files again via FTP. Standard settings in WordPress are 755 for directories and 644 for files. An important cause of a 500 notification are plugins and themes. In this case, follow the same steps as for White Screen of Death – WSOD. Contact your hosting provider if above mentioned solutions do not solve the problem. It’s possible that the Internal Server Error is because of an error in the server configurations. And otherwise they will be able to find the cause of the error notification in the server logs. This notification means that no connection is being made with the database. This notification usually appears during WordPress installation. The notification may also appear randomly. WordPress gets the information needed to make connection with the database from the wp-config.php file in the root. 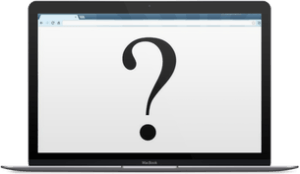 Check to see if the information is correct, for example, if you have recently moved your WordPress website. We advise this step particularly around the time of installation when there has not been any connection with the database. If your website has been working properly, but suddenly gives this error notification this points to a problem with the database server. This is not something you can fix yourself. Contact your hosting provider. 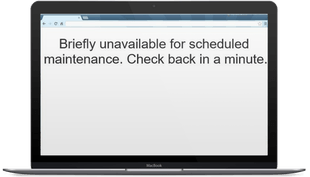 The server generates this notification when your website needs more time to generate a webpage than is available. What is the last plugin that you modified or installed? This is probably the source of the problem. Try deactivating the plugin via the WordPress back end first. Follow the same steps as for White Screen of Death – WSOD. Deactivate your theme to find out if the theme is causing memory problems. Follow the same steps as for White Screen of Death – WSOD. Contact your hosting provider to talk about options for increasing the memory for your website. The syntax error is a PHP notification that a piece of code has not been written following PHP guidelines and so cannot be executed. The notification will specify where the problem is. You can look up the file and line of code via FTP to change it. After updating WordPress you see this notification in your browser: “Warning: Cannot modify header information” – headers already sent”. Often this is caused by other error notifications on your webpage. If you see any other error notifications take care of them first. To solve this problem your can reach the file via FTP. Edit the file using a text editor and remove all whitespace at the beginning and the end of the code. When updating WordPress and plugins the maintenance mode is activated and the website is not available. Updating doesn’t take long (usually no more than a few minutes), so the down-time is limited. Sometimes WordPress gets stuck in maintenance mode after an update. During the maintenance mode a .maintenance file is created in the root. You can remove this. Note: this is a hidden file, so you must set up your FTP program to make hidden files visible. After removing the file the website is taken out of maintenance mode and will be live again. The maintenance mode switches itself off after 10 minutes, so if you don’t do anything the problem will solve itself. A common problem is that images cannot be uploaded to the media library. A condition for uploading images in WordPress is the permissions for the uploads folder. Uploads is a subfolder of the wp-content folder. Make sure the setting for the uploads folder and any subfolders is 744. The cause of the problem could be the image itself or the extension. Try uploading another image. If it works then you know the file was the problem. At WpUpgraders we use Kraken to optimize images. This means that images are optimized by Kraken at the time we upload them. A malfunction at Kraken could have effect on our websites. That’s why this is important to check. 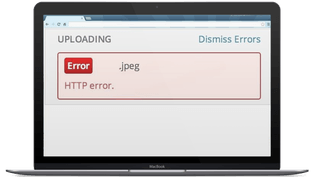 There may be a maximum upload size given by your hosting provider and via the php.ini file. When uploading to the media library this will be indicated under the upload button. Check to make sure the hard drive space given by your hosting provider isn’t full. You can usually see this via the hosting admin panel. Sometimes you share storage for your website space with your e-mail accounts. This can cause your storage to fill up quickly. In this case ,you will need to delete files from your media library or ask your hosting provider for an upgrade. In many cases a permissions setting on the server is the reason you are unable to upload images. Contact your hosting provider if you can’t find a solution to the problem. You are sure you have the right user name and password, but you still can’t log in. Are you sure you have the right login details? Try resetting your password via the forgot password function. Doesn’t help? Try the solutions listed below. ManyWordPress websites are secured by a security plugin like WordFence or iThemes Security. These plugins block an IP-address or IP-address ranges when too many attempts have been made to log in. This may be hackers trying to log in. But it could also be a colleague who has forgotten his or her password and tries to login multiple times in vain. An IP restriction is usually for a specific time, so you could just wait an hour and then try again. Another option is to (temporarily) turn off the security plugin via FTP. Many hosting providers look after the security of your WordPress website on a server level. It could be that you are locked out after failed attempts to log in. It is also possible that they changed your password for security reasons. Both admin and website visitors are not receiving e-mails via the website. Not when users register their information, not the forgot password function, notification of forms, order confirmations etc. The cause is probably that your e-mail is not getting through the spam filters. 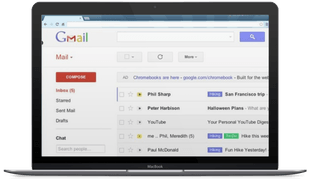 Instead of sending the e-mails from the website (transactional e-mail) via your website server send the e-mail via an transactional e-mail service. A well known option is Mandrill from MailChimp. Charges apply. Freemium alternatives are Mailgun, Mailjet and SendGrid. All above mentioned problems may occur if your website has been hacked. We’ve written a blog about removing malware from a hacked website.